For more information or to schedule an appointment with our Winston-Salem chiropractor, call 336-777-8450 today! Dr. William Moody is a chiropractor serving Winston-Salem and the surrounding communities. Dynamic Motion Chiropractic is located at 2909 Reynolda Road in Winston Salem, NC. We are three miles north of Wake Forest University near Old Town, NC. Here at Dynamic Motion Chiropractic, we help people suffering from headaches, neck pain, back pain, sciatica, sports injuries, and shoulder and knee injuries. We also offer care for injuries sustained in car accidents, including working with medical-payment policies and liens. We get patients out of pain without requiring long “care plans,” and provide relief of pain without popping, cracking, or twisting. We are a participating provider for all major insurance plans, including Blue Cross Blue Shield, Aetna, Cigna, Medicare, United Healthcare, and many others. The office specializes in the low-force chiropractic technique known as Activator Methods Chiropractic Technique www.activator.com. The technique utilizes specific tests for every joint in the body, paired with a precision instrument used to administer treatments. The result: a highly effective, customized patient experience. 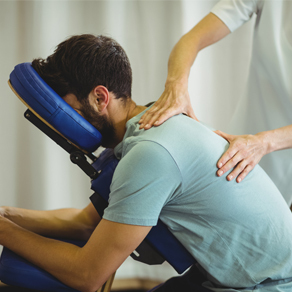 Chiropractic therapy is complimented by physiotherapies, including: electrical stimulation, muscle and soft tissue massage, therapeutic ultrasound, intersegmental traction (roller table), and high frequency diathermy. Dr. Moody uses his background in sports medicine and personal training to prescribe customized exercises for each patient. Dr. William E. Moody was born and raised in Winston-Salem, NC where he graduated with honors from North Forsyth High School. He attended the University of North Carolina at Greensboro, where he attained a Bachelor of Science in Sports Medicine and became nationally certified as a personal trainer with the American Council on Exercise. I have benefited tremendously from the chiropractic care I received from Dr. Moody. Dr. Moody is very knowledgeable and professional. The whole staff is great and caring. The pain in my shoulder was getting worse and I thought I would need surgery to fix it. After several visits with Dr. Moody my shoulder was as good as new. All I had to do was some easy exercises during the week between sessions. Thank you Dr. Moody! Our family loves Dr. Moody! When I was in extreme pain during the end of my pregnancy.... Dr. Moody was able to provide me with relief. If you are looking for an effective way to treat back pain than Dr. Moody and his staff will take great care of you!